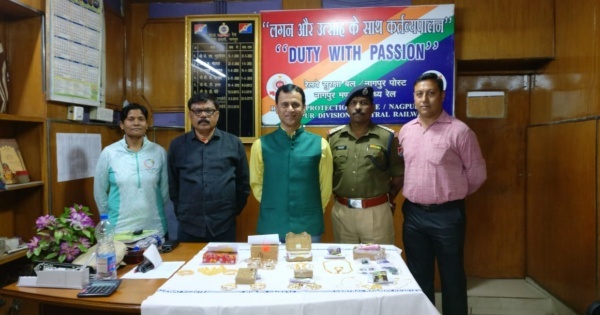 Nagpur: Special crime detection squad of Railway Protection Force (RPF), Central Railway, intercepted gold and precious stones worth Rs19 lakh from an agent working for a logistic and courier company based in the city, on platform number 2 of Nagpur station. The agent, identified as Dinesh Mishra, had received the consignment from another person travelling in Mumbai-Howrah mail. Senior divisional security commissioner Jyoti Kumar Satija said the latest haul was the fourth this year where RPF’s special team intercepted valuables, including gold and diamonds, being ferried without any supportive documents. “We feel some unscrupulous businessmen, especially bullion traders, are engaged in using agents to carry costly valuables in bulk quantities without any documents to evade tax. So, we hand the agents over to income tax department for further action,” said Satija. RPF this year, under Satija, has already crossed the landmark detection of more than 1,000 cases with a month yet to go, bypassing the tally of 2017. Mishra, who claimed to be working for Khandelwal Logistics and Courier Company, was spotted by RPF’s special team, which was scanning coaches of Andaman Express for illegal liquor consignments as the train passes through two ‘dry’ districts of Maharashtra; Wardha and Chandrapur. Sources said special constable Vikas Sharma was patrolling near Andaman Express when he came across Mishra, who was scurrying towards the staircase. Sharma’s colleague constable Usha Tigga too was in the vicinity. Sharma said the backpack with Mishra attracted his attention, and when he claimed to be a courier agent, he felt something was amiss. “We have nabbed such courier agents in the past with gold and valuables being ferried without any related documents. He was taken to a X-ray scanner, where the backpack was scanned. It showed the jewellery inside, which we asked to verify,” he said.